The suggested size and heft for modeling pieces over 18", our No. 213 modeling tool has sharpened steel cutting wires at both ends shaped to perform different sculpting techniques on a model. One end is the favored bullnose for shaping and digging; the inverse end, a rectangular shape, has been squared off for cutting straight planes on a smooth surface of modeling material. 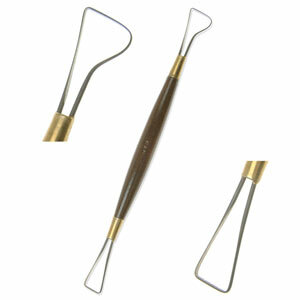 A perfect tool for working in Plastilina, self-hardening clay, moist (ceramic) clay and plaster.